The Fall 2017 Bonner Directors and Coordinators meeting brought together 110 staff on November 4-8 at the Claggett Retreat Center in Buckeystown, Maryland. The theme of this Fall’s gathering was Strengthening the 3rd and 4th year. You can see the full set of meeting presentations and handouts on the Bonner wiki. Social Action Courses — The was a pre-conference on teaching social action. On November 3-4, individuals from several campuses will join Scott Myers-Lipton, Professor of Sociology at San José State University, led the day-long session on how to integrate social action education through a course or co-curricular seminar. 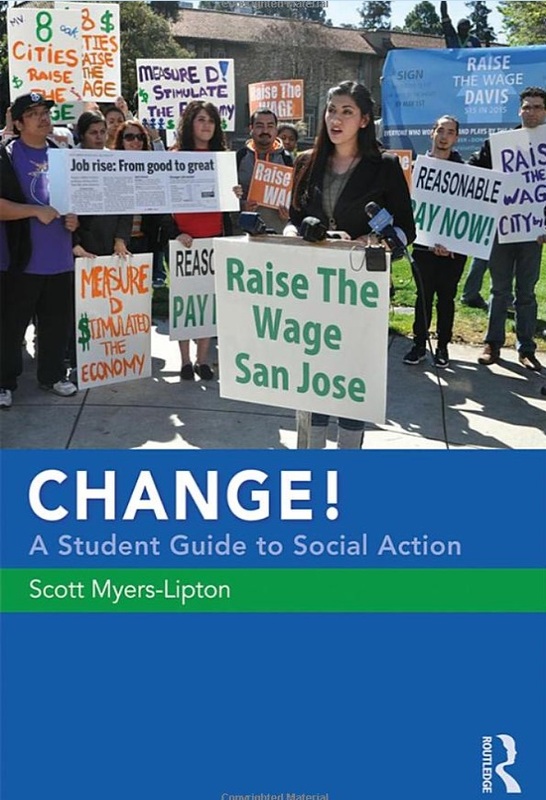 Myers-Lipton brought his experience as a community organizer to teach students these approaches and is the author of Change!, a new book he has shared with the Bonner network to replicate the idea. He and others have been successful in social action initiatives, including raising the minimum wage in San José and developing jobs for displaced workers. link to Change! Opening Night — We kicked off the meeting with an all-group presentation by Bobby Hackett that presented his analysis and thinking about the important opportunity to strengthen supports and experiences for students in the junior and senior year. Director and coordinators shared what is challenging and what is working with implementing upper level opportunities with their Bonners. This session set up the framework for the three rotations that campus teams will participate in – focusing on student leadership roles, training and enrichment, and integrating a community-engaged capstone capacity-building or social action projects. Liberating Service Learning — The meeting featured an group presentation by Randy Stoecker, a Professor in the Department of Rural Sociology at the University of Wisconsin, on the theme of his recent book “Liberating Service Learning.” He spoke about how traditional institutionalized service learning has produced weak outcomes for students and even weaker outcomes for communities. He argued that we can do more and do better. He proposed that we need to completely rethink higher education community engagement toward a model that can produce real community outcomes and real social change. Randy has led numerous participatory action research projects with community development corporations, community organizing groups, community information technology programs, and others in North America and Australia. 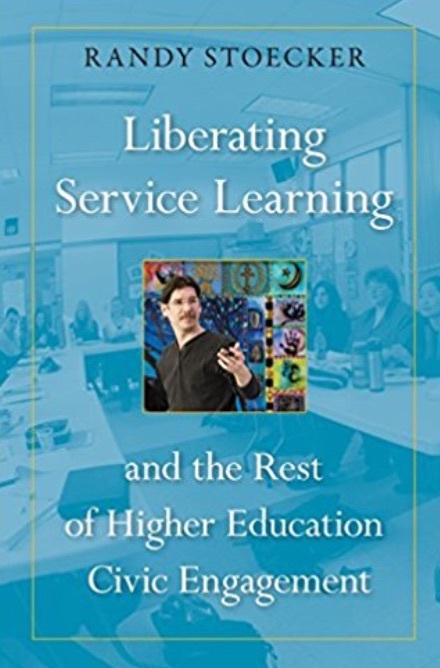 He has written extensively on community organizing, including the works: Defending Community, Research Methods for Community Change, Community-Based Research in Higher Education, and Liberating Service Learning. Student leadership is one of the foundational cornerstones of the Bonner program. Student leaders not only act as an extension of campus staff and provide an outlet for greater peer-to-peer mentorship, but also have potential to help address significant challenges facing the program, campus, community, field, and network. Our current challenge is creating scaffolding and support necessary to promote the highest level of engagement for students within the third and fourth year of the Bonner Program. This session provided strategies and engaged participants in discussion about how student leadership can help build this developmental capacity through an emphasis on community-based capacity building projects. Every Bonner Program uses a variety of strategies to develop and implement their Training Calendar. Our hope that is through trainings students are able to reflect on their experience, be exposed our knowledge areas, and develop personal and leadership skills. This session explored how our network can use current and new tools to deepen the developmental scaffolding that supports students to take on higher levels of leadership and projects. Campus teams had the opportunity to reflect on their own training calendar and learn from others, walking away with ideas to strengthen their programs. In 2015, we began discussing Community Engaged Signature Work, the idea that students culminate their undergraduate education with an integrative experiential education project. Last year, we discussed the concept to give it greater definition, identifying needs to build it (like getting buy-in from partners and faculty). Since that time, 15+ colleges and universities have participated in a community of practice to integrate it on campus. About half of them have already integrated a capstone expectation for senior Bonners or are working to carry these projects out this year. Others have identified this as an aspiration. This strategy session provided time for staff to identify a model that works best for their campus. Teams shared strategies and approaches, learned from each other, and engaged in developing the supports and tools to integrate capacity-building senior capstones. We discussed: (1) identifying projects and connecting students with partners; (2) defining the capstone (and expectations); (3) advising; (4) educational, meeting and training structures; (5) if and how faculty and/or credit are involved. The Swearer Center is building a co-curriculum for our 90 current Bonner Fellows (160 at full scale) and for the additional 800+ students who engage with communities through our Center. This workshop shared the process by which we developed learning outcomes, created individual workshop templates to align with these outcomes, mapped our existing co-curriculum, and built an Intranet library. The second half of the workshop crowdsourced ideas for advanced workshops that build student capacity around systems change. This workshop provided an opportunity to focus on and discuss the concepts of wellness and well-being in the Bonner Program. During this session, participants reflected on what makes up wellness – including the notion of mental health, physical health, thriving, and resilience – and also talked about some of the challenges (like stress and depression). Then, participants identified and discussed what campus resources students can access to support their own wellness. This workshop provided a deeper look into the student leadership models from Berry College and DePauw University. Staff from each Bonner program provided an overview of their leadership structure, rationale for the development of their student leadership team, reasoning for their leadership roles, and how leadership will continue to change in the future. This glimpse into other successful student leadership models and opportunity to ask questions was intended to give participants useful strategies for strengthening their own Bonner student leadership and ways that student leadership can develop capacity for high level engagement. How can service-learning program impact the ways students think about politics and political engagement? There are reasons to expect that service-learning can contribute to the development of a political consciousness and the skills necessary for political participation, but does it lead to political participation. Do students consider themselves politically engaged? If not, what are the potential barriers? This session provided an overview of David's research on how participation in an in-depth service-learning program shapes the ways students think about their service as it relates to politics. Participants then discussed how it relates to everyone's work. The Swearer Center has developed a workshop, called "Providence is Not Your Playground" that we piloted with our Bonner Fellows and have now used as part of our training for all student volunteers. This workshop explored the history and relationship between Brown University and the City of Providence, encouraging members to contextualize themselves as participants in this history, and providing resources for effective engagement in Providence. In this session Juan Carlos delivered a condensed version of the workshop and then worked with other campuses to think about how to translate the template of the workshop to unpack the relationships between their campuses and the cities where they reside. Training and reflection are both integral parts of all Bonner programs. Siena College recently went through a redesign of our programmatic training calendar to enhance campus wide engagement and deepen our impact in the community. The voice of students in our program played a huge role in making these changes and we are in the process of assessing our redesigned training calendar. This workshop was designed for anyone interested in improving their four year training calendar. A key focus of the session was on utilizing student leadership to increase the quality of a training calendar. Drawing on AAC&U’s Signature Work and the IUPUI Center for Service and Learning’s CivicMinded Graduate Model, this workshop explored the multiple dimensions of a strong, comprehensive and impactful civic engagement effort leading to a culminating Engaged Signature Projects for Bonner students and others. Participants had the opportunity to reflect on the strength and weaknesses of their own campus and community and to explore what are possible next steps (or first steps) in building on the strength of the particular community and institution? How have you supported your colleagues and staff members to advance their careers and performance? What opportunities and strategies have you and your institutions utilized to further your colleagues' ability to increase the impact of their work and efforts? Given the continued professionalization and credentialization of our work, how have you leveraged resources to empower your colleagues? This session discussed strategies to create developmental opportunities for staff, shared resources and frameworks of professional development within the field, and explored how we can support one another within and beyond the Bonner network.